Sanders announced this week that he would again run for president. During his previous run in 2016, Old Towne Media was his main vendor for advertisements throughout the cycle. Sanders was the primary candidate disbursing funds to the little-known Old Towne Media and ultimately paid more than $80 million from his presidential committee to the firm, which was also his top vendor. Old Towne Media has not recorded payments from any other campaign committees since that time, a search of Federal Election Commission filings shows. Not much was initially known about Old Towne Media, which was established a year prior to Sanders announcing his 2016 presidential aspirations. The firm was a "front company" for the Washington, D.C.-based Canal Partners Media, a media company where two of its top partners, Shelli Hutton-Harting and Barbara Abar, were tied to past controversies involving Sanders's wife, Jane. All three worked as media buyers for Sanders's 2006 Senate campaign. Sanders's Republican opponent at the time accused Jane Sanders of "improperly profiting" from the ad buys by the campaign. Sanders's campaign manager, Jeff Weaver, claimed that Sanders's wife made the buys as a volunteer and then gave her commission to the firm, Abar Hutton Media. That firm was operated by Hutton-Harting and Abar, who now both help run Canal Partners Media, which ran the Old Towne Media. In the summer of 2017, Canal Partners Media served as an advertisement buyer for the Saudi American Public Relation Affairs Committee (SAPRAC), a pro-Saudi interest group. The firm placed television ads primarily focused in the D.C. market that appeared to be directed at decision makers, including President Donald Trump. 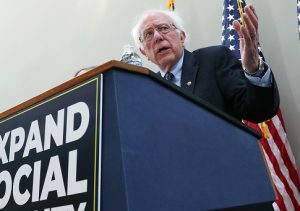 Sanders himself has been a vocal critic of Saudi Arabia, which he called a "despotic dictatorship" that has "supported terrorism" around the world, and is a leading supporter of an anti-Saudi bill. The $138,000 ad buy for SAPRAC, which was aimed against Qatar, netted a commission of $20,000 for Canal Partners Media, which does not appear in a search of foreign agents records. SAPRAC was founded and is run by Salman Al-Ansari, a citizen of Saudi Arabia, and is registered in Delaware, while its headquarters is in D.C. SAPRAC has been described as Saudi Arabia's version of the American Israel Public Affairs Committee (AIPAC). "It's important to mention that SAPRAC doesn't aim to present itself as a lobbying group" Al-Ansari said at the time of the campaign. "SAPRAC is here to educate the American audience primarily about the overall Saudi-US relations. More importantly, SAPRAC is a product of a citizen not a state." Al-Ansari tapped the Podesta Group, a now-shuttered firm previously chaired by Clinton ally Tony Podesta, to help with the campaign. However, the Podesta Group's involvement was not known until later, as the group initially did not register as a foreign agent on behalf of SAPRAC. Al-Ansari himself did not register SAPRAC as a foreign agent until August 2017, according to FARA records. SAPRAC's funding is not fully known. Al-Ansari, who owns a number of businesses incorporated in Saudi Arabia, claims he funded most of it himself before receiving money from the government of Bahrain. SAPRAC is currently being sued by Ali Al-Ahmed, a Saudi dissident and head of the Gulf Institute, a D.C.-based think tank, for defamation. Canal Partners Media did not respond to requests for comment on the work they performed on behalf of Saudi interests, its partners' relationship with the Sanders, or if they would be performing work for Sanders's newly launched 2020 presidential campaign. The firm has also been used by a number of other prominent Democrats, including Sen. Amy Klobuchar (D., Minn.), who is also running for president. Klobuchar paid the firm more than $1.1 million during the 2018 election cycle, filings show. Sanders's campaign could not be reached for comment.